This review is on the GEKO E100 Full HD 1080P Dash Cam. In today’s day and age where road rage videos are constantly popping up on YouTube, a dashcam is a must. The Geko E100 dashcam is a cheap way to record that high definition eye witness video. This dashcam is very small in size and non obtrusive. The suction cup mount is pretty strong. 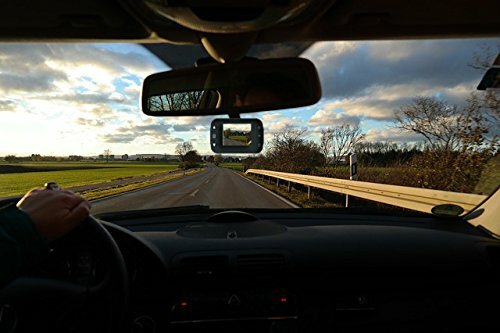 In the past I have had problems placing suction cup mounts near my rear-view mirror because there were little black dots on the glass, and the suction cups wouldn’t stick to it. However, this one sticks! I can now mount it behind my mirror out of sights way. Also, the fact the it is entirely black, makes it less visible from the outside. The camera includes an 8GB micro SD card, which is expandable up to 32GB. A long cigarette lighter power cord also came in the box, giving me enough wire to tuck away along the top of the windshield and then down the drivers side pillar, so it shouldn’t just be dangling in front of the window. There is also a small built in battery, for short time use without the wire. The great thing is that once the car goes on, the camera turns on and starts recording right away. Same thing with turning off, the power goes out the camera turns off so you never really have to touch the camera. Also, the built in G sensor detects sudden movements like crashes, and can mark the video files “crash” when activated. As per the quality, this small thing puts out full HD 1080p video with audio, thanks to its on-board mic. During the day the video is crisp clear, and at night good. Just make sure to keep the white LEDs on the front off as they can cause a glare on the glass which will interfere with the camera. The Geko E100 is the first dash cam I have used that takes measures to prevent out of focus footage caused by hot climates. This is a great feature to have, being that my dashcam is always mounted to my windshield in way of the sun, which in the summer can reach above 100 degrees. The video can be watched on the bright LCD, but I would recommend popping out the SD card and watching it on a bigger computer screen. I received this dashcam in exchange for an honest review, and for the price I highly recommend it.